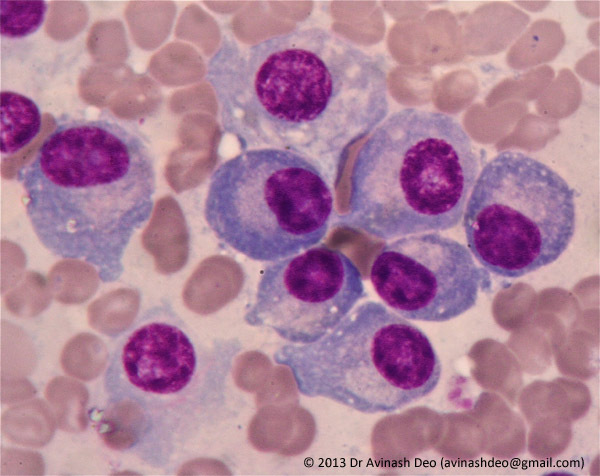 Normal plasma cells are 15-20 μm in diameter, have an eccentric nucleus and a pale blue cytoplasm. there is a perinuclear halo which corresponds to the Golgi apparatus. The cytoplasm may show vacuoles. The nucleus has clumped chromatin. The cartwheel or clock-faced pattern is less evident on smears than on histological sections. It is normal for cccasional cells to have have two or more nucleus. The figure above shows plasm cells from a patients with multiple myeloma that are farly normal. Plasma cells morphology in patients with multiple myeloma ranges from normal to moderate to severe dysplasia.